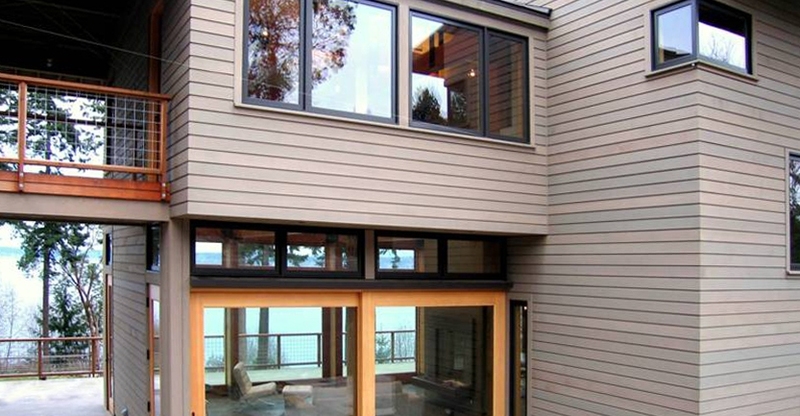 Situated on a bluff overlooking Saratoga Passage on Washington’s Whidbey Island, this vacation home design offers open spaces for casual entertaining as well as intimate spaces for personal reflection. Scheduled for completion in 2013, the building design works with the slope of the land to create a ‘hunkered-in’ side towards the uphill slope, with the garage slipped into the slope and covered with a vegetated roof. On the water side, the house gently rises away from the slope, ending in a dramatic cantilevered deck that soars over the landscape towards the water view. A series of oversized doors allows the house to literally open up to the site allowing for a free flow between inside and outside. A large open breezeway is cut through the house to further reinforce this spatial flow. This configuration also creates a separate wing that houses the master suite and a guest quarters with its own entrance on the upper level. Strong, simple materials such as concrete and structural timbers form the ‘bones’ of this textured yet elegant house. Sustainable design strategies including a green roof, operable passive ventilation and a geothermal heat source are part of this home’s design. This project began at Olson Sundberg Kundig Allen and was completed at Scott Allen Architecture. Scott Allen, primary designer.